Dealers and suppliers both are the key personalities of sales supply, therefore they are more or less similar in terms of responsibilities and a dealer agreement is a legal agreement that sketches the terms of dealership between a dealer and a supplier. The dealer agreement includes the purpose of the deal, payment style, and the delivery date. The agreement could explain the duties and responsibilities of the dealer in detail and the termination grounds. Dealers are sometimes known as retail distributors. The dealer buys good from the supplier and sells them further in his assigned territory. Sales promotion and marketing of the product is the task of the dealer. Dealership contract is featured as “exclusive when the supplier is prohibited from commencing sales in the dealer’s region and in addition not get involved in an agreement for the same region with some other dealer. In contrast, a non-exclusive contract gives freedom to, the supplier to sell all or part of his goods as documented in the agreement. The free template available online is usually a general type of legal document. Marketing terms are used to craft a valid paper template. The content of dealership agreement with terms and conditions completely reflects the authenticity. Every data is editable and customizable. However, the explicit terms and condition block is kept empty to be filled in accordance. The dealer is free to add any or all terms and conditions, as required. 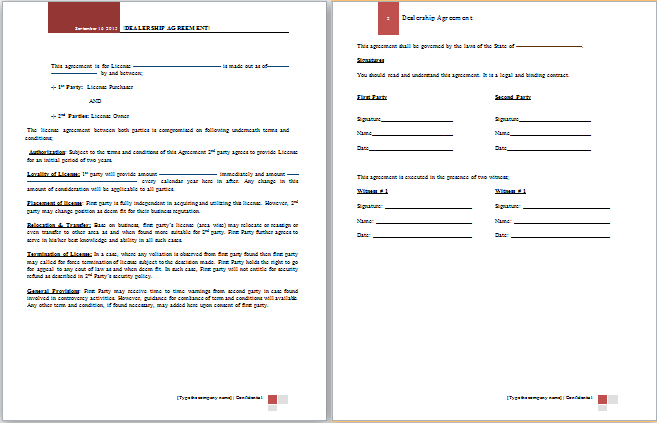 A dealership contract template download from here without any cost to pay.